How fun are those glasses!?!? Such an easy effortless look, but very chic. Love it. Layers done perfectly! 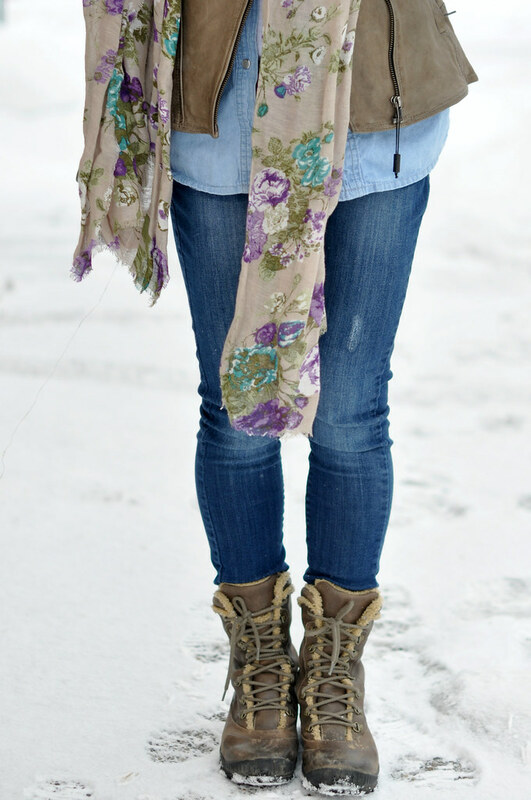 Love the scarf, is such a cute touch! Wow look at that blanket of white snow.....and awesome how you're able to look chic & flirty with everything you put together! i love how chic this outfit is.... the layers you chose complement each other perfectly! Found your post via Manic Monday link up! All our snow is almost melted and gone, and it makes me hopeful that it's gone for the season! A girl can dream! But these layers you are wearing make me so happy! Love the floral scarf as the finishing piece and those glasses are just so fun! I really need some mirrored glasses in my life! Thanks for linking up! Great layers, I'm so ready for warmer weather! Sydney, I love this outfit--pops of color in winter!! I would love to see more of that jacket!